The book Kato'aga, is in two sections. 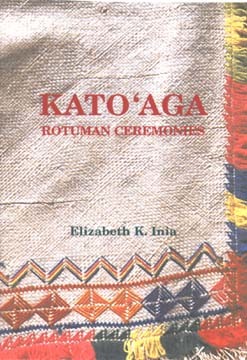 Part one contains descriptions of the main components of ceremonies, including material goods such as fine mats, food cooked in an earth oven, chiefly tables, garlands, anointing oil, and turmaric; key roles played by knowledgeable elders and chiefs; and the fundamentals of ritual etiquette. Part two consists of descriptions of particular ceremonies, including those associated with life events (birth, marriage, death, etc) and rituals pertinent to the installation of and ritual homage to chiefs. To provide a deeper understanding for her descriptions, she adds in an appendix an essay on Rotuman spirituality that elaborates on the cosmological assumptions underlying the ceremonies. A second appendix includes includes a number of traditional chants. By permission of the Institute of Pacific Studies, University of the South Pacific, the contents of the book are online on this website.